Tropical cyclones are low-pressure systems that form over the tropical oceans, in areas of high sea surface temperature (above 27ºC). These storms may cause devastation if they make landfall in populated areas. 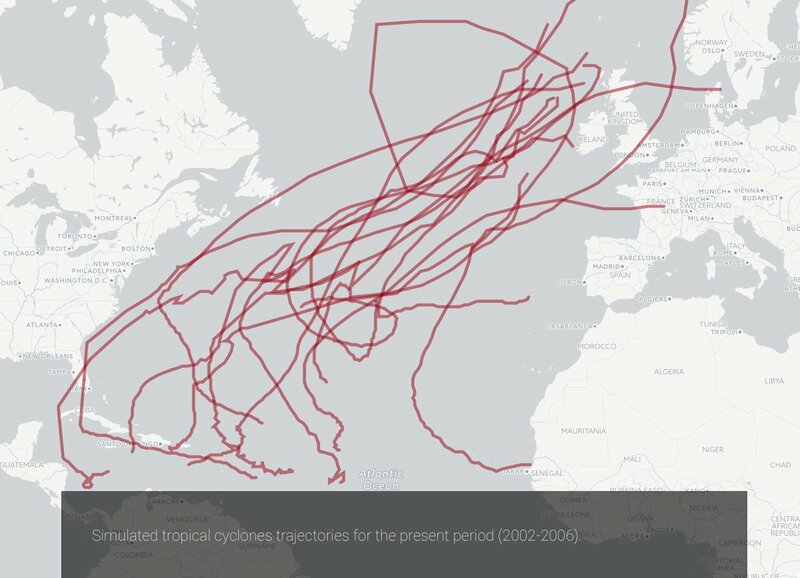 Although Europe is seldom affected by tropical cyclones directly, during September-October, post-tropical systems do sometimes reach Europe after undergoing a transition to extratropical storms. These storms are called post-tropical cyclones; they have a tropical origin and can cause heavy rainfall and hurricane-force winds. The 2017 Atlantic hurricane season has been particularly active and Hurricane Ophelia, having transitioned to Storm Ophelia, made landfall in Ireland. Such storms are particularly concerning for the agricultural sector. The high-resolution climate model simulations and projections of PRIMAVERA will be used to achieve a better understanding of these cyclones, trends in their occurrence, and their future evolution. A summary of these issues, including the societal risks, are compiled in an animated, interactive 'storymap' that also explains the role high-resolution modelling.